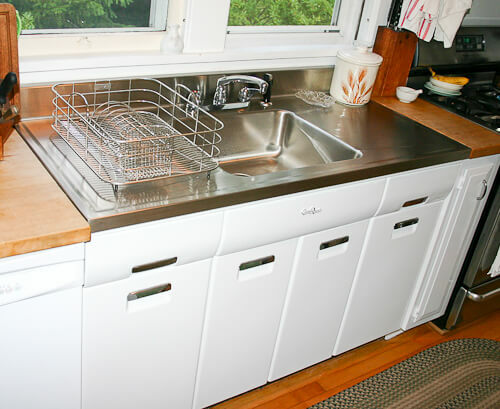 Classic farmhouse drainboard sinks look quite charming in a vintage kitchen. 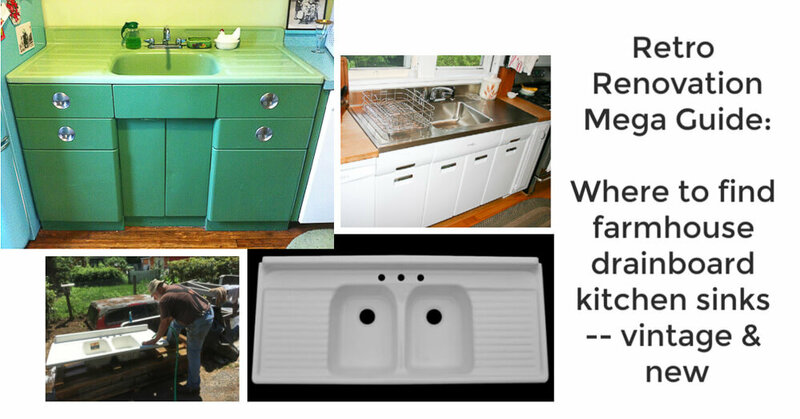 Whether you are looking for a reproduction drainboard sink, or are hunting for vintage, I’ve pulled together all my research to help you find what you are looking for in this buyer’s guide. Overall, I count 9 difference sources depending on the age and material of farmhouse drainboard sink that you are looking for. If you are the owner of an older porcelain enamel bathtub or sinks — or are considering buying one — please see my May 2, 2016 story Understanding potential lead hazards in old porcelain enamel bathtubs and sinks and ceramic tile of any age; this article focuses on raising awareness around three other potential sources of lead dust exposure in your home – old porcelain enamel bathtubs and sinks and ceramic tile of any era — and steps you can take to assess and, if required, address them. A note on terminology: I have seen the terms “Porcelain Enamel”, “Enamel”, and “Porcelain” each used to describe the top coating that is baked onto metal substrates on bathtubs, sinks and other products. As such, you may see the various terms used interchangeably on this blog by me and by others who are interviewed or commenting. To verify what types of products you have and what they are made of, do your own research including consulting with the original manufacturer or your own professionals. Here is slide show of 16 vintage Kohler kitchens that give you some idea of the designs. 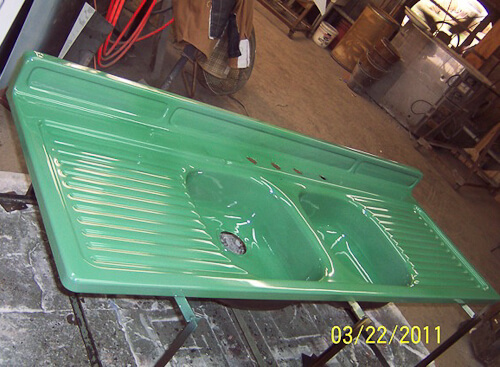 Ken in Massachusetts specializes in collecting and selling original-condition drainboard kitchen sinks. See this story. 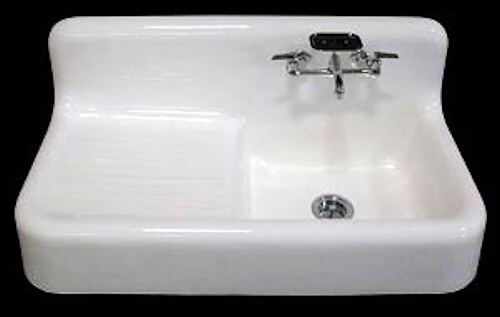 Vintage sinks can usually be found at salvage companies, on craigslist, your area ReStore / Habitat for Humanity, etc. See this story I did on Ken, who specializes in collecting and selling original-condition vintage kitchen sinks. 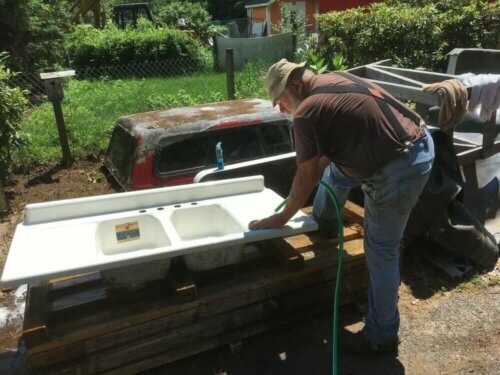 If you already have a vintage drainboard sink in hand, but it needs restoration, it can be done. Yes, vintage sinks can be re-porcelained. 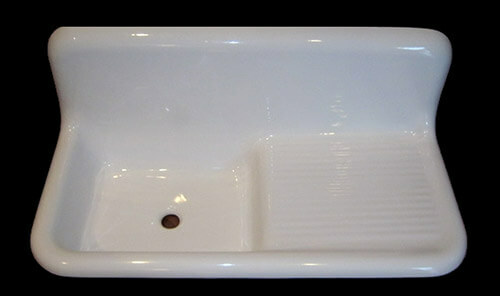 Custom Ceramic Coatings is one resource we found that can re-porcelain cast iron sinks (photo above is an example). Reader Barb had a porcelain-enamel-on-steel sink (not cast iron) and found another source Independence Porcelain Enamel, to reporcelain it. Do your own research with these companies to ask what materials and processes they use in their re-porcelaining processes. Kohler says “no” to: Magic Eraser, Comet, Bar Keepers Friend, Zud, vinegar, etc…. for cleaning its porcelain enamel cast iron. Please consult with the manufacturer of your sink you buy new; and again, if your sink is vintage take care considering this story. Now I’m diving into reproduction / new farmhouse drainboard sinks with porcelain enamel coatings on cast iron substrates. I know of several sources for a reproductions of apron style farmhouse drainboard sinks. These designs below are porcelain enamel on cast iron — the very old school way to make these sinks. The first is the Sanford Cast Iron Kitchen sink with drain board and apron from Signature Hardware — like Laura used in her adorable summer cottage kitchen. Above: Strom Plumbing also has a 42″ design – also in cast iron. Another available option — also in cast iron — is the Clarion farmhouse drainboard sink. It is made by Strom Plumbing and marketed by a number of companies such as our longtime advertiser, deabath.com — but you can shop around. This apron sink is 60″ wide. These sinks will all use a vintage style wall-mount kitchen faucet. As some examples, see our story 8 vintage style wall-mount kitchen faucets. 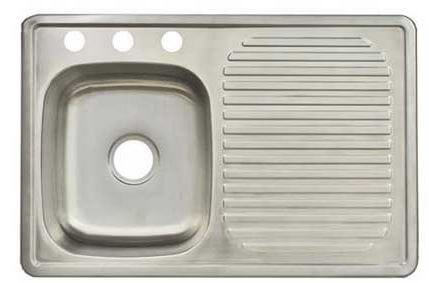 Next up: Drainboard kitchen sinks made out of metal — steel, mostly, but check before you buy. Elkay still makes a number sink-top drainboard sinks very much like the porcelain enamel on cast iron. See this story on the different styles of Elkay stainless steel sinks.. above: Read this story about how Joe used one of these Elkay steel drainboards to replace a damaged original sink in his kitchen. Second, we did a separate round up eight places to find drop-in stainless steel sinks. See this story, too, about ways to do stainless steel sinks and countertops in your kitchen. 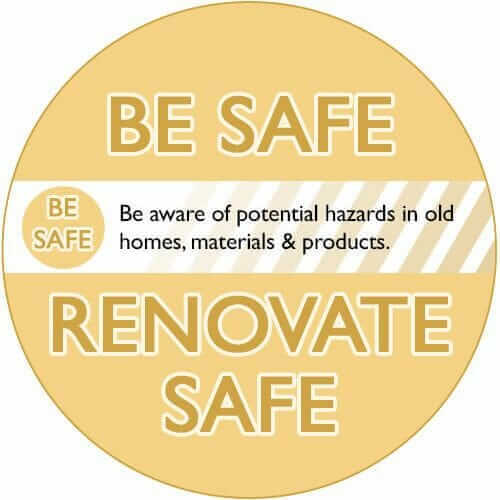 Check local building codes to ensure these are to code in your locality. Also check companies like Ikea and Franke, they may have some “drop in designs”. Need a faucet? I like the one that Joe used. It looks like << this Chicago model. I also am a #1 fan of Dishmasters — I use one in my kitchen! Next up: Modern technology allows for drainboard sink reproductions to be made from modern polymeric materials. 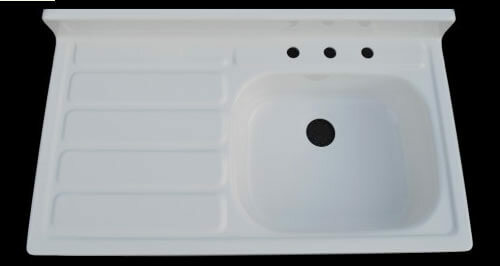 Nelson Bath Tub offers six reproduction farmhouse drainboard sinks manufactured using gelcoat and fiberglass reinforced polyester resins. Above is the “Apron Sink”. Above: Apron sink with double drainboards. 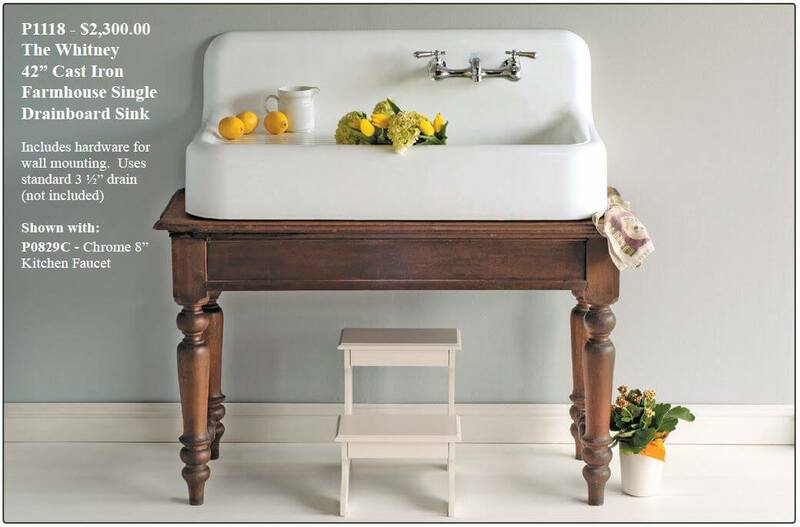 Above: The second sink from Nelson Tub and Bath is a 66″ wide double sink double drainboard farmhouse sink. 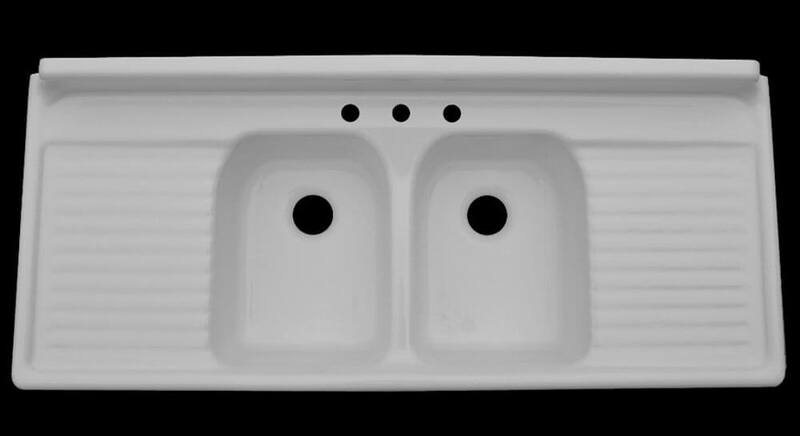 Above: Nelson’s double bowl, double drainboard 60″ sink. 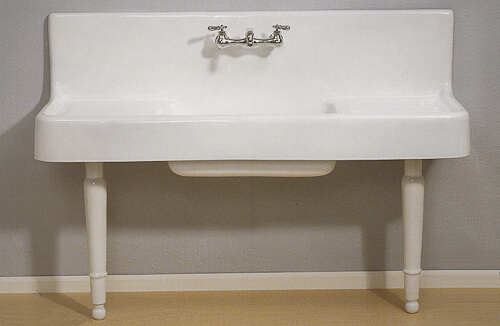 Above: Farmhouse sink from Nelson’s with single bowl. 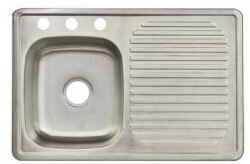 Above: Nelson’s 42″ single bowl, single drainboard sink. And be sure to check their website, they continue to add new designs each year, it seems. And, there are a growing number of kitchen drainboard sinks being molded out of stone particles combined with resins. CorStone drainboard sinks come in five designs and lots of colors — including pale yellow, greens, pinks and even a bluish lavendar. (*affiliate link) lists for $933 plus shipping. While this model has the lovely drainboard — and appears to be made of a composite including hard rock granite — it is not what we’d describe as “retro” in style. Still, we’ll put it out there for you. This model is available in eight neutral colors — but also has the drawback of no faucet holes — limiting counter top options. Whitehaus seems to have apron-style sinks with drainboards, made of fireclay. There are quite a few colors. 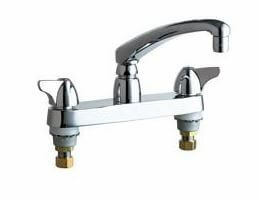 (*affiliate link), prices starting at $258 — with three holes for a deck mounted faucet — appears to come in all of the same 36 colors as the kitchen sink. So if your laundry room is right off the kitchen, and you like colorful matching sinks, this might be just what you’ve been looking for. See all of my kitchen sink research here. I have a drainboard sink (like the one pictured with the lemons on it) and love the table shown in that picture. Any idea where you got it? I’m looking for a vintage look cast iron or porcelain apron sink with two bowls and a drainbord on one side. I’ve seen one before but can’t find again. Hi Raymond, I don’t know of this design. 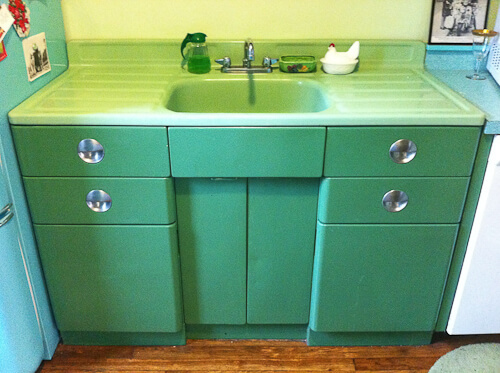 Hi looking to identify and sell my vintage jadeite color sink with faucet. What is the best way to identify and sell it. Hi Liz, I am not an expert on identifying vintage sinks. Re selling: Usual places include craigslist, ebay, etc. Please note: No buying/selling here in the Comments on the blog or it would become chaos. What the word on getting vintage metal cabinets repainted? This is a 1929 English Tudor with an original Geneva kitchen with updated appliances. Also see Kitchens/Steel Kitchen Cabinets or /Readers and their Remodels where various readers may have shared the approach they took.